The new 2014 Mazdaspeed 3 will have considerably more power than the 2014 Mazda3 hatchback and sedan, but will it be enough to compete with Ford and VW? Just how much power would a new 2014 Mazdaspeed 3 need to have to make it a worthy performance car? With the new 2014 Mazda hatchback and new sedan delivering 155 horsepower and 150 lb ft of torque, it would be good but not great if it gets 200 hp. That’s what Auto Express is reporting from the UK. They say Mazda is working on bringing back the hot hatch, but it will be naturally aspirated and will drop the turbo power. In an interview with an unidentified senior engineer at Mazda, he told AE that the launch of the “impressive new 3” will likely happen late this year but that it would return “but not as you would expect”. He was quoted as saying the horsepower of the new 2014 Mazdaspeed 3 will be around the 200 hp range and have a rev limit of around 7000 rpm. Mazda says their new SkyActiv engine technology will allow them to get more horsepower out of the non-turbo engine and still get good fuel-efficiency. This is a far cry from the last-generation 2.3-liter turbocharged Mazdaspeed that pumped out 263 horsepower. 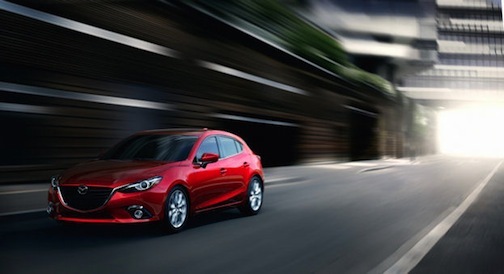 But it will be considerably more than the standard 2014 Mazda3 sedan and hatchback. Mazda is obviously doing this to meet new fuel-mileage standards yet offering a higher-performance version of the 3. Mazda will have some stiff competition coming from the 2014 Volkswagen GTI and Ford Focus ST. Both have better performance numbers and they deliver. The new 2014 GTI features a new 2.0-liter turbocharged direct injection engine. The powerplant gets a number of new upgrades that give it increased power. The seventh generation Golf GTI sends at least 162 kW / 220 PS to the front wheels. Ford’s first global performance car, the new Focus ST also comes turbocharged with a direct-injection 2.0-liter EcoBoost engine that pumps out 252-horsepower. The Focus ST is capable of 154 mph and will launch from 0-62 mph in 6.5 seconds. Mazda will have a tough time convincing performance fans that the new 2014 Mazdaspped 3 has superior handling and agility to make up for the difference in horsepower. But with the introduction of the new Mazda3 hatchback and sedan, the Japanese automaker may be content with what likely will be good sales from those models. Even if the new 2014 Mazdaspeed 3 with have 0-62 mph launch times below 7 seconds, it won’t be able to compete with the performance of the 2014 Volkswagen GTI or the Ford Focus ST. Look for the new Mazdaspeed 3 to launch late this year. Stay tuned.